Harbor of Refuge – Chesapeake Chapter U.S.L.H.S. The first light was a temporary white frame tower structure built in 1902 with a five-day lens lantern. In April 2002, the United States Coast Guard leased Harbor of Refuge Breakwater Light to the Delaware River and Bay Lighthouse Foundation, Inc. Visit their web site for the latest tour information. 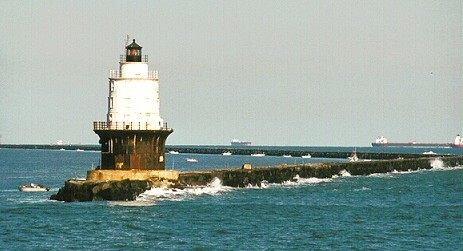 The lighthouse is visible from the Cape May-Lewes Ferry and from Cape Henlopen State Park in Lewes, Delaware.